Chain, compass, and plane table surveying. Levelling instruments, ordinaryandpreciselevelling.Theodolites,traversing, trilateration,andtriangulation.Tacheometry.Contouring. 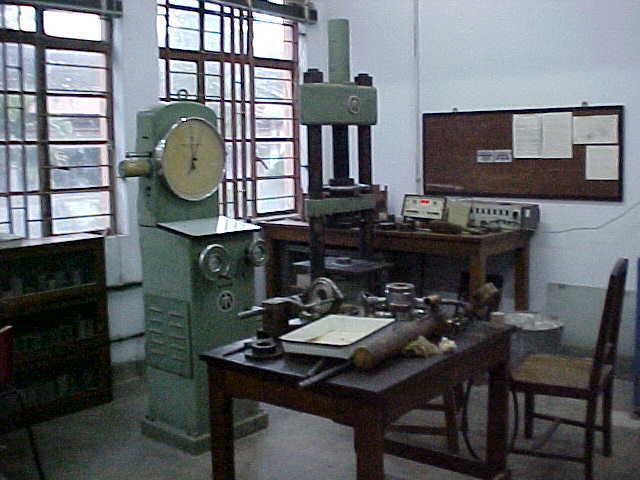 Electronicdistance measuring instruments, gyrotheodolites,and other developments in instrumentation and techniques. Errorsand adjustments. Practical work based on topics in 282002.
andinstallation.Ventilationsurveys,instruments,and ventilation planning. Auxiliary ventilation. Tunnelventilation. Controlled recirculation. Surfacemine layouts. Methods of opening of deposits. Designof benches.Methodsandequipmentfordrilling,blasting, excavation,loading,andtransportation.Continuousmining systems.Stability of slopes. Placer mining ,groundsluicing, hydraulic mining, dredging. Dimensional stone mining. Inseamandhorizonminingsystems.Pillarminingmethods, applications, layout, development, and extraction by conventional andcontinuousminingmethods. Pillarminingforcontiguous seams. Longwallminingapplications,layout,development,and extractionby partially and fully mechanised methods.Selection ofmethodsofmining. Hydraulic stowing.Specialmethodsof mining thick and steep seams. Principlesand basic design features ofmechanical,hydraulic, andpneumatic power transmission. Cutting andwinningmachines for coal. Electric, pneumatic and hydraulic drills, drillsteels and bits. Drilling rigs and jumbos. Mine pumps and waterpumping system.Wireropes.Safety devices. Cages,skips, andshaft fittings. Mine cars and man riding systems. Correlationofunderground and surface survey.Measurementof depthofshafts. Setting out curves, stopesurveying, openpit surveying, and subsidence surveying. Mine plans, projections, and models.Specialmine surveys. ElementsofPhotogrammetryand field astronomy. strength.Photoelasticityand scale modelstudies.Basicsof numerical methods in geomechanics with applications. Classification and choice of stoping methods. Vertical,inclined and lateral development for different stoping methods. Methods ofstoping - open, overhand, underhand and breast stoping.Sublevel stoping.Shrinkage stoping. Cut and fill methods. Orebreaking. Handlingofbrokenore, waste and materialinstopes.Stope mechanisation. Ore drawing system. Linearprogramming-concepts,graphicalsolutions,simplex method, primal-dual models, sensitivity analysis,transportation and assignment problems. Network analysis - problems ofshortest path, minimal spanning tree, maximal flow, CPM and PERT.Dynamic programmingandstagecoachproblem.Discreteandcontinuous probability distributions, stochastic process andMarkovchains. Basicqueueing models with constant arrival andservicerates. Inventory models. aroundmine openings. Ground failure and pressureonsupports. Stabilityofwideopenings.Mechanicsofbumps.Designof supports in mine workings. minesanddewatering.Mineillumination.Noisecontrol. Occupational health of miners. Traininginoneor two select minesforeightweeksduring summer. Guidedvisitto coal mines and associatedinstitutionsfora period of two weeks. Practical work based on topics in 283001. Practical wotk based on topics in 283010. Practical work based on the topics in 283009. Practical work based on topics in 283004. Practical work based on topics in 283005. Viva based on the coverage up to the end of third year. devices.Trackless vehicles - loaders, shuttle cars,andLHDs. Hydraulic transport systems. and procedure of sampling. Reserve estimation. Simplediscounted cash flow concept. Mine valuation. Statutory provisionsrelating to mineral concession and conservation rules. Royalty. Taxation. Discreteeventsimulationandrelatedstatisticalconcepts. Simulation of longwall mining and openpit transportation systems. Reliabilitymodels.Basics of managementinformationsystems. Mineventilationnetwork analysis. Truckdispatchingsystems. Ultimatepitdesignmodels. Productionschedulingforgrade control. Overview of blast simulation packages, integrated mining software,expert systems, geographical informationsystemsand GPS with special reference to mineral industry. Training rules. Mine Rescue rules, pit-head Bath rules. Circulars ofDGMS.Introduction to Mine Safety. Mineaccidents,reports and records. Accident investigation and analysis. Guidedvisittoselect opencast mines andtwoweeksmine surveying camp. Practical work based on the topicsin 284003. Viva comprising the four year BTech course work. Surface mining vs. ecological balance. Air pollution from surface mining and processing-monitoring, control and standards. Air pollution dispersion models. Water pollution – types, control and monitoring, ground water contamination. Noise and ground vibrations. Tailings dams design. Reclamation, Revegetation Environmental legislation, Environmental management plan, and Economics of mining environment control. Automatic Control; Concept of static & dynamic characteristics; transfer function. Controllers ; On-off, PID, Cascade, Automatic control of mining and mineral processing machinery. Instrumentation; Functions of instrumentation. Characteristics of instruments. Sensors for measurement of displacement; vibration. Sensors for measurement process variables, viz. density; moisture; PH; flow; temperature; level; pressure, gas analyzers. Signal Processing, Telemetry. Display of data Intrinsically Safe DAS Introduction to computer & microprocessor control of mines, mineral processing systems. Experiments to estimate water pollution parameters. Soil characterization, noise and vibration measurements. High volume sampling and air quality analysis. Advancedtreatment of mining methods and facemechanisationin bordandpillarsand longwall mining. Layoutoffaces,face equipmentincluding winning, conveying, andsupportingsystems theirselection and organisation. Techniques ofminingsteeply inclined and thick seams. Hydraulic mining of coal seams. extraction. Solution mining. Under-sea mining. handling techniques and equipment. Drilling and blasting designs. Wastedisposal,dumpsand tailings dams. Landreclamation.Pit slope design. Continuous surface mining. Role of minerals in national economy. Mineral resources availability – Indian and global perspective. Theory of depletion – case for minerals. National and international trade in mineral commodities. Stockpiling conservation. Cartel price. Investments in mineral resources sector – Opportunities and risk. Mineral taxation. Mineral market structure. Advanced treatment of aerodynamics. Psychrometry. Estimation of mine heat load and cooling loads. Climate prediction models. Design of air cooling systems and direct contact heat exchangers. Mine ventilation network analysis – graph theory fundamentals. Hardycross and linear theory models. Controlled flow. Ventilation thermodynamics. Tracer gas techniques. Controlled recirculation. Methane control. Ventilation planning with diesel and Raton. Geostatistical concept, probability and statistics, Mineral inventory, Extension methods and application of classical statistics, Regularisation, Auxilliary functions, Liner Kriging methodology, Mining applications, Geostatistics for quality control, Basis of non-parametric geostatistics and indicator Kriging, GEOEAS Software. Principles of planning, General principles of mine planning and design. Planning and design of mine reconstruction, and modernization of technological processes, planning and design of new mines, Optimization of mine parameters. Economic problems in mining investment. Detailed planning and design of unit operations, Planning and scheduling of mining operations. Introduction to reliability concept, Basic probability theory, Application of reliability in mining systems, Probability distributions in reliability evaluations – reliability functions. The Poisson distribution, Weibull distribution, Series systems, Parallel systems, Partially redundant systems, Reliability allocation, Markov modeling, Application of F.T.A. and FMECA in mining systems, Maintenance and maintainability – definitions, Concepts and application, Maintainability Prediction. Safety concepts, Mine safety systems, Techniques and procedures used in safety analysis, Risk concepts, Fault tree and Event tree analysis, Database in mine safety, classification of mining accidents, Accident prevention, Loss control, Computer applications in systems safety. General theories of rock cutting. Design of cutting tools for optimum penetration and wear characteristics. Mechanics of Rotary and percussive drilling, Mechanics of coal cutting tools. Drillability and machinability characteristics of rocks. Advances in rock cutting techniques. Mechanics of rock breakage in blasting. Design of blasting. Ground vibration due to blasting. Terzaghi rock load classification. Rock structure rating. Rock mass rating. Q-system etc. Ground failure and pressure on supports. Mechanics of various support systems : Yielding – mechanical supports, Power supports, shield supports, Arch supports, concrete lining, Stowing/Back filling for strata control, Rock bolting, and cable bolting. Design of shaft support system. Economic and technical aspects of Reclamation. Reclamation methods – back filling, outside dumps and their stability. Top soil handling. Assessment of soil productivity potential, Revegitation. Reclamation plan and land use plan. General requirement of protection of hydrologic balance. Physical and Geometrical Geodesy, Geodetic reference systems, Geophysics, Geodetic instrumentation and techniques. Theory and practical aspects of photogrammetry, Satellite imagery and their use in Cartography, Principle and design of plotting machines.